Nail fungus has always been easy to get and difficult to get rid of. Once it infects one nail it’s fairly certain other nails will follow suit. It’s unsightly and uncomfortable. Who wants to hold hands or stroll on the beach barefoot when your nails are discolored and peeling? The symptoms are easy to distinguish: The nail thickens, becomes brittle, misshaped, and as the healthy shine fades away and the infection spread it can separate from the nail bed causing discomfort and sometimes doesn’t smell very nice. The Fungi that cause the infection live in moist environments and can even enter through a cut in the skin. More often than not feet affect more than fingernails because they are confined in shoes and tend to get moist. It’s important to treat the affected area before it spreads and gets out of control. There are many treatments on the market that have some level of effectiveness but unfortunately many come with drawbacks. There are Oral antifungal drugs which can take six to twelve weeks before nail growth and can have some nasty side effects such as skin rashes or in more severe cases liver damage. There is a medicated nail polish which needs to be painted on daily and needs to be used daily for a minimum of a year. There is medicated nail cream, or in a more extreme case surgically removing the nail. The most innovative treatment available today is laser treatment. Since going to a clinic to get the laser treatment on a regular basis is quite costly, Cure Ex, a new clip on laser device can treat and cure the nail fungus effectively at home. Cure Ex Laser is affordable, light weight, portable, and safe. There are no negative side effects when you use Cure Ex. All it takes is seven minutes for each nail treatment. Just clip on the Cure Ex device on the targeted area and within four weeks the results will be noticeable as the fungus fades away and a new healthy nail replaces the infected one. Clip on the Cure-Ex, push the button and within seven minutes the first treatment is finished. The device shuts off automatically, so there is no need to time the treatment. Going on holiday? Just charge the battery and you are good to go. 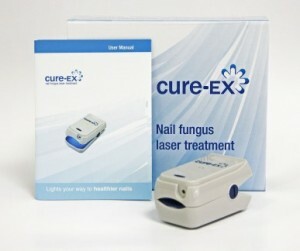 Using Cure Ex is the newest breakthrough for treating and curing nail fungus. Cure Ex was developed by leading medical experts in the field of skin ailments and is CE approved. The Cure Ex kit includes a power outlet, adapter, and instruction manual. This entry was posted in Skin Care Products and tagged cure ex laser, Cure-ex on November 30, 2015 by admin. It’s summertime and it’s hot. Barefoot walks on the beach, fancy sandals, hand holding while dreaming of your future; it’s the time for romance. But wait how on earth can you take off your socks and shoes or hold hands while having a romantic interlude if you have nail fungus?!? It’s uncomfortable and it’s embarrassing and it’s ugly. Currently, the common treatment usually involves ointments that need to be applied several times a day or in stubborn situations medicines taken internally hoping to solve the problem, but none of these solutions are completely effective and antifungal pills can cause other problems internally aside from a potential allergic reaction, it can affect your liver negatively. Why take a chance when there are more innovative solutions on the market? Cure Ex is the most effective and innovative treatment available today for home use. Cure Ex uses low level laser therapy combining pulse laser radiation to eliminate the fungus and blue light energy to prevent future infections by destroying the fungus cells found on the outer surface of the nail. Within a four week period of time Cure Ex eliminates nail fungus while improving the health of the nail. It’s portable and no other medications are necessary. Low level laser treatment is cost effective and noninvasive with no side effects. It eliminates the pesky fungus and will improve the health of the nail within four weeks of daily treatment. ! Cure Ex is easy to use, remove it from the box, put it on your nail that has fungus, and let the treatment begin! A single nail treatment takes only 7 minutes. Cure Ex will automatically shut off after 7 minutes, so there is no need to constantly glance at your watch, so sit back and relax while Cure Ex cures and rids you of nail fungus. The Cure Ex device includes a power outlet , adapter, and an instruction manual and a box for storage. Cure Ex has a 180 day money back guarantee with a two (2) year warranty. You can order Cure Ex on iSkinProducts.com. Where the customers are important and satisfaction is guaranteed. This entry was posted in Pain Relief and tagged Cure-ex, Home Laser Treatment, Nail Fungus Laser Treatment on August 2, 2015 by admin.